My initial dream began when I was nine years old—"I want to go to a university in America!" At that time, in my country, many Deaf students struggled to go to a university due to a lack of disability rights. I am many things: I am Deaf. I am a woman. I am a minority. I am an English as a Second Language learner. I grew up attending schools without accommodations. Attending a university was a big dream, one that seemed very far away from me. But ten years later, my dream finally came true. I moved to America alone to study at a university. I received interpreters and notetakers for the first time. My eyes opened to new worlds. I was so excited. A new dream began—"I want to become a social worker! I want to earn a PhD degree! I want to empower Deaf people!" Ten years passed again since my initial dream. I am now a PhD student, and I am also a social worker. But of course, it has not been easy to keep my dream alive. It was tough. I have encountered discrimination and many barriers in higher education, not only my disability, but also because of my race, my gender, my language, and my socio-economic status. These issues were more than just simple discrimination, but I did not know what to call them. In Winter 2017, I had an opportunity to meet Jay Dolmage at the University of Waterloo. He gave me his book, Academic Ableism (2017). 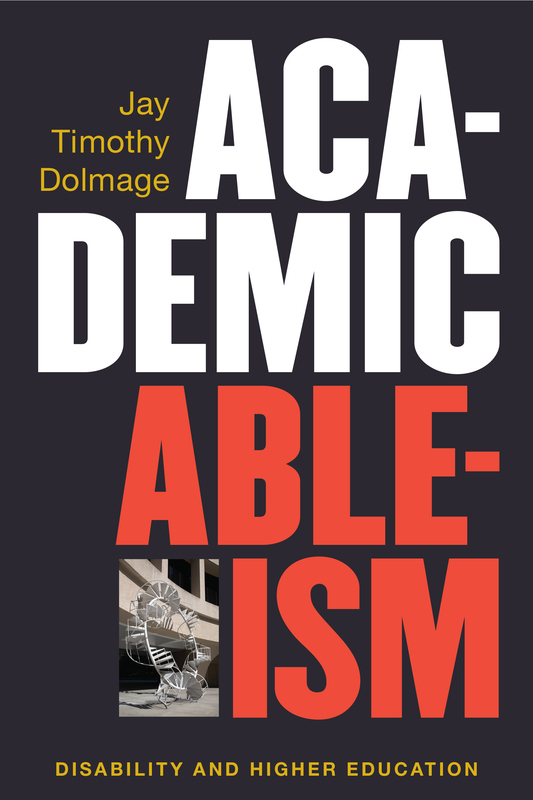 The words "academic ableism" struck me—meaning of a set of negative beliefs about the academic abilities of those with disabilities (Dolmage, 2017). "Yes, this is what I was looking for!" I devoured his book immediately. This book opened my eyes to understanding how academic ableism applies to my Deaf student experience in higher education. This book was perfect for disabled students who have experienced discrimination in higher education. However, I was concerned that this book was challenging for disabled students with no knowledge of rhetoric and disability studies to understand. For this reason, I have decided to contribute a book review for readers who have experienced discrimination in higher education and seek ways to empower themselves. In my book review, I have summarized each chapter and added my own personal experiences as they relate to each chapter to help readers to understand concepts surrounding academic ableism. I hope that my book review and my own experiences are helpful for readers to understand the context of this book, as well as to explore the reality of disabled student experiences. More importantly, I hope that the book helps disabled students to identify academic ableism and to find ways to empower themselves to speak up: "No, this is not an appropriate response to my accommodation request. This is an academic ableism." Dolmage, Jay. (2017). Academic ableism: Disability and higher education. Michigan, MI: University of Michigan Press.